Should I sell my perfect LS60THa PT for custom solar scope? I absolutely love my new Lunt. Brand new, gives phenomenal views and is a joy to use. But hauling out two different solar scopes to image or view is a bit of work. I mostly do yard viewing, so it isn't the end of the world....but I do take it to the farm on occasion and when camping, space is limited in our small car. 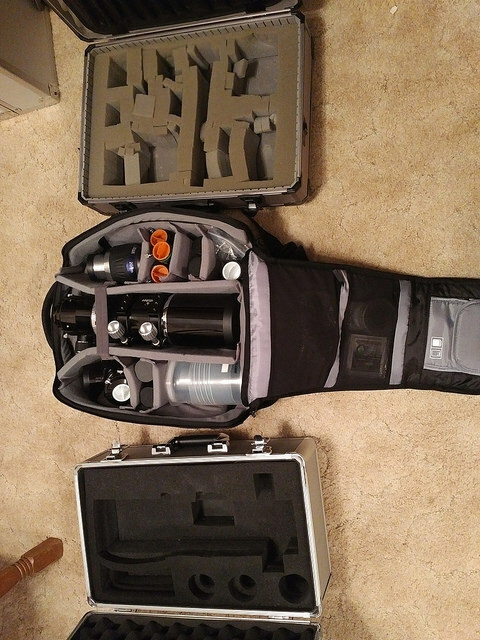 I have an awesome new Nikon bag to transport the majority of my gear (eyepieces/diagonals) for my night refractor (Equinox 80mm f6.25) in one trip. If I sold my LS60THa and kept my blocking filter, and got my friend to 3D print an adapter for cheap and bought a new lunt 60mm elaton, I would be able to transport both my WL and Ha set up and night set up in a single backpack! I would just have to make space for the elaton in the backpack. Would you do it? Is the custom solar scope set up finicky/prone to problems and not worth the hassle? I would not gain any money, it basically evens out making the switch. Pro's would be that I would only have to upgrade one focuser not two for each scope. Also, portability goes up, and I can use the elaton and blocking filter for other solar scopes in the future with other refractor purchases. Con's? Only one I can think of so far is no dual mounting two scopes with the AZ, but I don't bother doing this unless for outreach, as I would rather use the porta mount or EQ mode for visual and imaging. Edited by Tyson M, 28 June 2017 - 02:20 PM. There's also an Energy Reduction Filter (ERF) on the front of the LS60 which is not particularly cheap. I'd get a slightly bigger backpack. Actually it's just the LS60 and the blocking filter and Sol-Searcher if you have one. Eyepieces and other stuff would be shared. There must be some Tupperware thing you could fit the scope into with a little foam. There isn't room for two refractors lol. This a fairly large bag. An elaton, a blocking filter, a 1.25" lunt hershel wedge and a 2"diagonal and a few eyepieces would work. Otherwise another case with gratuitous impact foam with my sol searcher, clamshell and ls60tha would have to be brought along. Edited by Tyson M, 28 June 2017 - 02:52 PM. Shoot. That is nice and compact. You could contact Lunt and see if they know what would be possible. I mean they sell all of the parts so it must be doable to make a Frankenlunt, or a Fauxlunt. They may know of ready-made adapters. I don't see any ER Filters on their website, though. Oh wait, are you talking about buying a front filter? Not a pressure chamber etalon. I had that on the brain. The front filters have the ERF, so you'd be good. I don't know that you could print a threaded adapter. The threads are pretty fine. There must be one somewhere. Edited by NMBob, 28 June 2017 - 03:14 PM. Yes I am talking about front mounted elaton, blocking filter combo for the Equinox 80mm. No custom pressure tuner Frankin-Lunt! You may be right about the 3D print, I would have to contact a machinist to make a custom adapter. Edited by Tyson M, 28 June 2017 - 03:29 PM. Lunt mentions about having some adapters in stock when you go to order a 60mm filter. Your Equinox may be popular enough that they may have one, or SkyWatcher might. If you can afford it, keep the scope, get the DS etalon to use on your LS60PT, and with an adaptor and the BF you can use it on other scopes as well. I had the intention of selling my LS60 when I bought an LS100, but in the end decided to keep it as it is easy to set up for quick looks and in DS mode, produces fantastic views. A front mounted etalon would be quite good. It would be a direct trade in your case, to go from dedicated to an adapted front mounted solution; with an adapter plate. I'm a fan of modular. My primary solar scope is a 120mm refractor, and it does white light, calcium and hydrogen alpha without changing scopes (and I often use it to look at planets and DSO too), and I vastly prefer this (I image 99% of the time I'm using it). I have 7 scopes right now and constantly juggling which one for what is actually more annoying than it is useful to me these days, so I've just become much more favorable towards a modular multi-use setup. My exception was to add a PST to my kit, because it's so small, it fits in a purse and lets me take a peak (and others) with no fuss, for cheap. But for serious stuff, I use bigger scopes on a tracking mount. So, if that sounds like your direction, I would say to explore the front etalon option. I love having a versatile tool to get several views from, day and night. the front mounted etalon is not worth the trade off. Have to agree. The tilting Etalon is good, but pressure tune is far superior if your primary interest is imaging. ......in my humble opinion, of course. My head tells me why mess would a good thing? I think keeping it and double stacking it in the future is a better idea like GUS said. Then if I want to experiment with front elaton and blocking filters I wont have to lose a perfect solar scope in the process. for what its worth, you can get a 25mm double stacking eyepiecee filter off ebay for less than $150. It will do the exact same thing as the $900 front mounted filter, lower the image brightness. I will post a picture of the results when I have time, but you just control the tuning with the pressure knob and never worry about the eyepiece filter. No tilting is required and its just a straight through. It may add a reflection, but so does the front mounted filter. Unless you send your current scope directly to lunt for them to customize a secondary etalon for double stacking, it just wont perform like it would be expected. Edited by icecreamcat, 29 June 2017 - 05:21 PM. Lunt doesn't require a return of your scope for double stacking. They sell DS etalons marked as DS certified, not sure if that means much, but my LS60F produces fantastic views, significantly better than my DSII for my LS100. yea you are correct about that, but it is entirely different when they ship it to you from their altitude. So it is best to send them the scope have them set it up and then return it to you. There is no "standard" on etalon performance. It is different for every state. Very interesting, guess, that should also work with the Lunt50 scope. What about the reflections solution? Front mounted ethalon is pretty good at getting them outside of the view, by turning the wheel. I presume, here we will have to angle the 25mm filter. Whats the solution, to mount the filter and where would it be the best to place it, before the BF diagonal, or after? I'm not sure, but convert .15nm to Angstroms. I think the only thing you are going to see through that ebay filter is red. The etalons produce sub-ANGSTROM bandwidth views which is what you have to do to see the details. That filter may be for Ha DSO photography. I see 2 of Bob's listings for 656.3 H Alpha 0.15nm, one is for DP mounted and the other is Normal Incidence. The latter one is $5 more expensive. Any one care to explain, what's the difference and which one to get, to DS the Lunt50. Oh! Never mind. I had it stuck in my head that it was x100 not x10. Oops. They are both exactly the same filter, except one is directly on-band at 0 degrees. The other has to be tilted to come on band. In theory you use the on band filter as your primary h-alpha transmitter, and the tilted filter as a secondary "wedge" gap. All hydrogen alpha etalons are wedge shaped if im not mistaken. they are in actuality two band pass filters, stacked. There are precisiion low expansion spacers seperating the two creating an air gap. 1 filter = bandpass two filters = fabry perot etalon. i work 7 days a week, monday thru sunday. i rarely have time to image the sun. when i do have some free time ill bring the scope to work and take pictures for you. until then please be patient. i have no reason to lie to you. the blocking filter is 8 angstroms, the omega filter is 1 angstrom. you can just automatically do the math that blocking 7 extra angstroms AFTER the lunt blocking filter will remove that excess bandwidth. Edited by icecreamcat, 08 July 2017 - 10:34 AM.